Though relatively small in size, France has long been a major presence on the international stage from an economic, military, and geopolitical standpoint. The country has also long been regarded as a bastion of arts and culture in Western Europe. Up until the early 20th century, France was a major colonial power with territories across large swathes of Africa, southeast China, India and North America. The country is the third largest by size in Europe, and occupies an area that is roughly the same in size as the U.S. state of Texas. Paris, with its iconic Eiffel Tower, is the capital and also the largest city in France. Other major cities in the country include Lyon, Marseille, Lille and Toulouse. France has one of the most developed economies in the world. The country ranks second in Europe in terms of nominal gross domestic product and the fifth in the world overall by GDP. French citizens enjoy one of the highest standards of living in Europe and have access to what is widely considered as the best health-care system in the world. Though Paris is by far the most famous city in France, the country boasts of numerous other cities and sites of great historic and cultural significance. The French Riviera, situated along the Mediterranean Coast, for instance, is a major destination for the rich and the famous from around the world. The picturesque city of Reims, with its rolling hills and vineyards, belongs to a region of the country that is internationally famous for champagne production, while Normandy, located across the channel from England, is famous for its World War II landing beaches. Shipping a car to France from the U.S. is not very complicated. 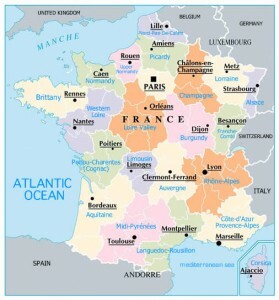 Many auto transport companies provide door-to-door international shipping to France. In almost all cases, companies that offer these services not only transport the car, but also help customers clear the vehicle through the French customs process. France international shipping companies typically take between two weeks to four weeks to transport a car from the U.S. East Coast to France. Shipping companies offer customers the option of transporting their car in a container, or on board a Roll on Roll off vessel. The cost of shipping a car to France or of shipping a car from France to the U.S. varies considerably depending on where the vehicle is picked up, and where it needs to be dropped off. On average, shipping companies charge between $1,500 and $2,800 to transport a car in a container from the U.S. East Coast to France. France has a fairly liberal car import policy for vehicles shipped from Europe and from countries such as the United States and Canada. However, customs duties are an important consideration when shipping to France. All foreign made vehicles imported into France attract customs duties and a value added tax of nearly 20 percent of the assessed value of the vehicle. These taxes often end up adding hundreds of dollars to the cost of shipping to France.